Hawaii Gov. David Ige has declared a state of emergency to deal with the state's homelessness crisis just days after city and state officials cleared one of the nation's largest homeless encampments. The move will help the state speed up the process of building a homeless shelter for families, and the state is considering four possible sites, Ige said at a news conference Friday. "We are making sure that we have options for those who are homeless to move into an emergency shelter, and the biggest deficit in the system is shelter space for families," Ige said. "So the emergency proclamation would allow us to stand up shelters for families in an expeditious manner." 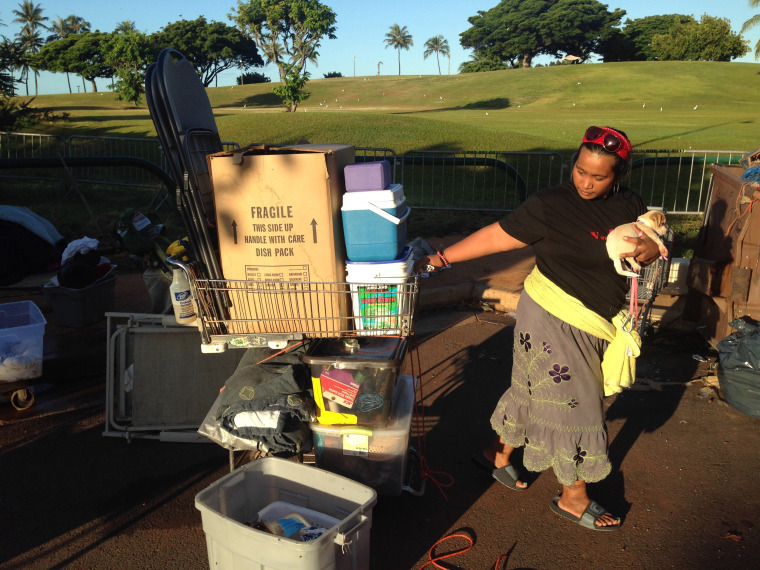 Hawaii saw a 23 percent increase in its unsheltered homeless population between 2014 and 2015, and a 46 percent increase in the number of unsheltered families, said Scott Morishige, state homelessness coordinator. There were 7,260 homeless people in Hawaii at the latest count, meaning Hawaii has the highest rate of homelessness per-capita of any state in the nation. The state has identified $1.3 million to expand services to homeless individuals and families, Morishige said. In addition to a new shelter, the money also would go to the state's Housing First program, which provides homes and services to chronically homeless individuals without requiring them to get sober or treat mental illness first, and programs that help families pay deposits and rent. The new transitional shelter the state is envisioning would house about 15 families at a time, Morishige said. Two of the sites under consideration are in Kakaako, the neighborhood where the large homeless encampment was cleared, and the other sites are in Liliha and near Sand Island. The recent clearing of the Kakaako homeless encampment could be used as a model in other parts of the state, Ige said. By coordinating with service providers, more than half of the estimated 300 residents of the encampment, including 25 families, were moved into shelters and permanent housing, the governor said. "They definitely are off the streets and in a better situation where we are in a position to provide them services that will help us move them permanently out of the state of homelessness," Ige said.